The Kanji characters on this either mean "male werewolf" or "at least this gaijin is caught up on his sketches of the day". Regardless, I wanted something more cartoony. He looks like he could be a gnoll to me. Either way he is pretty awesome. I see a hunchback catman…. (:-) Perhaps a Kzinti from Larry Niven books. A teenage mutant warrior werewolf. I like it. I always dug anamorphic characters. Doomed, good eye, but as soon as I read your “The tail is kinda strange” I noticed it, and yes, that really isn’t much of a wolf tail. But on with the sketch. 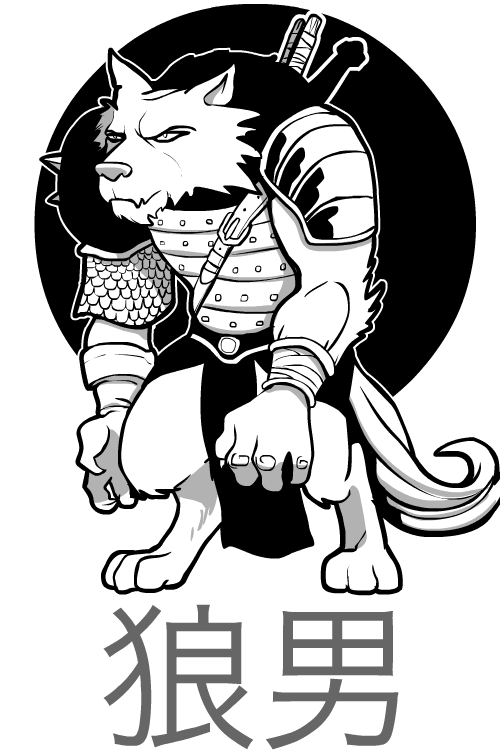 Werewolves are like my favorite mythological monster, and it kind of looks like a ninja werewolf. I have only seen this case once before… Jeff you should really do like a realistic werewolf for your next S.O.D. That would be a nice head for HM3.